No more do you have to be prone to climbing nor well equipped for speleological adventures in order to explore caves and grots, and enjoy an underground refreshment during hot summer days. Central Istria has prepared a speleological treat for you, Baredine Cave, protected geomorphological natural monument that you can reach without a sweat. Barendine Cave is the first speleological site in Istria adapted for tourists, and has been attracting visitors since 1995. Within 132 meters of depth, Baredine Cave will astonish you with its treasure – underground lakes and their special resident, Man's Fish, endemic animal life of underground karst that thrives in oxygen rich waters and low temperatures. Baredine Cave also hides many underground sculptures which amaze visitors with their shapes and structure. This unusual interior often hosts speleological photography exhibitions. Don't miss Baredine Cave during your holiday – it's open for visitors from April till October with organized tours that start every 30 minutes. 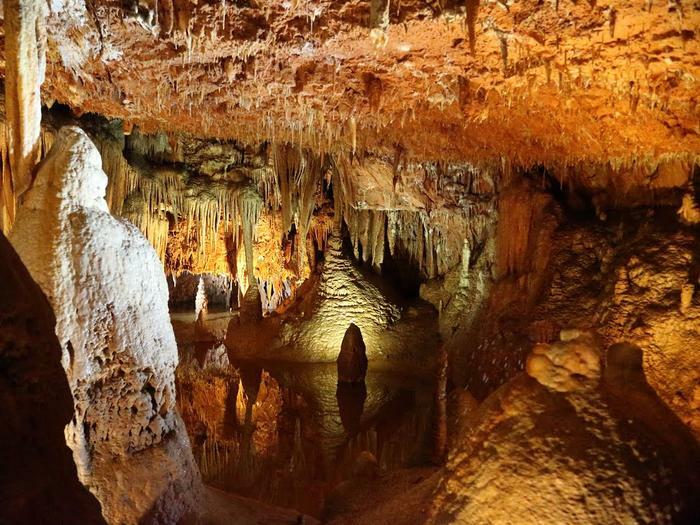 All you have to do is follow your guide into the underground world of stalagmites and stalactites and listen him telling you the story of its endemic animal life, origin and beauties. For those of you seeking adventure there's a cave climbing training center where the amateurs and even your youngest loved ones can give it a try at rope climbing and descending technique. However if you don't feel adventurous at all, you can always relax in the nature of Baredine Cave and surrounding vineyards and olive trees, or just lay back and enjoy your view of the sea with a glass of famous Istrian wine in your hand.